Liam Kinsella admits he is thoroughly enjoying his new role as Walsall’s right-back. 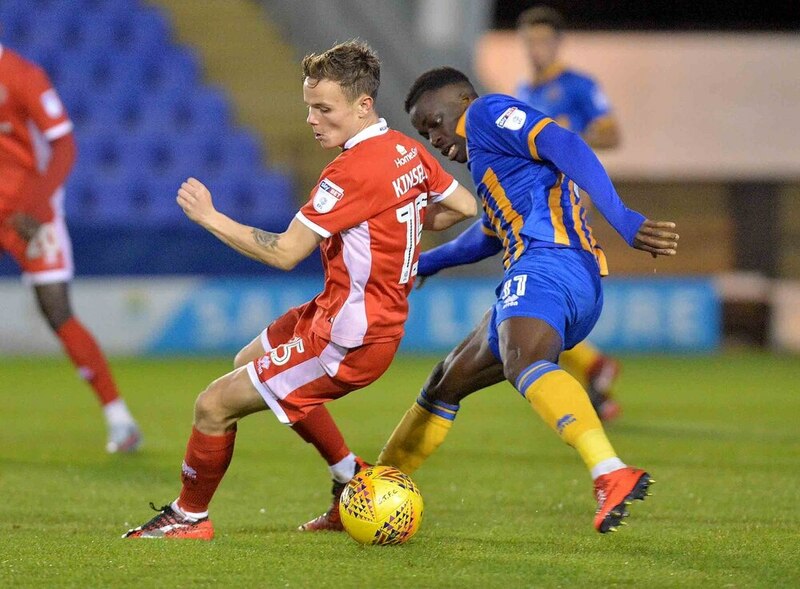 The 21-year-old, who joined the Saddlers when he was seven, played the majority of his football in central midfield or in the number 10 role before the start of this season. But following a chat with boss Jon Whitney over the summer, it was agreed the youngster would look to cement his place in the team on the right side of defence. Kinsella initially started the campaign behind Nicky Devlin. But he was restored to the side for the draw at MK Dons last month. And he has gone on to keep his place in the side since with a string of impressive displays against Doncaster, Southend, Newport and Shrewsbury. “I feel this season I have progressed a lot in the right-back role,” Kinsella said. “It’s helped nailing down that one position. “It means the gaffer can look at you as someone who plays there. “I have played in central midfield and as a number 10 but I feel comfortable at right-back. “I enjoy the defensive side of the game. And I think defending is one of my strong points. “It’s been good playing in lots of different positions. Kinsella was initially a striker when he first joined the youth set-up at the Banks’s Stadium. But while he has spent the majority of his career further forward, he believes the primary role of a right-back is to defend. “I joined Walsall when I was seven or eight,” he continued. “I was a striker back then and loved scoring goals. I’ve changed positions a lot over the years. “But I think it’s important to be flexible. I’ve met quite a few lads who had really good ability but their attitude wasn’t there. “As a right-back I put defence first. “I want to keep a clean sheet, defend first and get forward after that. “The attacking side is something I am looking to add to my game. A Republic of Ireland under-21 international, Kinsella was an unused substitute as his national side secured a 4-0 win over Israel last week. He was also part of the squad that faced Norway yesterday. And he believes his time away with the Boys in Green is also crucial for his development. “It’s a good experience travelling all around the world and going to places like Azerbaijan, Germany and Norway,” he said. “I haven’t got as much game time as I would have liked. “But it’s always a good experience. Things I learn with Ireland I can bring back to Walsall.